I can’t quite recall where I first met the very colourful Zabby Allen, but we often seem to turn up in the same places as one another! Zabby may not agree with me, but she certainly seems to have the multi-hyphen career thing (which so many of us are striving for) sorted with a wonderful array of creative work, including her own range of products. You may remember Zabby’s fab happy dance from Just A Card week… that sealed the deal for me and I realised that we needed to have a chat! I am a colourful creative from London who freelances for a number of small publications including The Happy Newspaper by Emily Coxhead, Caboodle Magazine (as Crafts Editor) and a mini magazine for the Lucky Dip Club subscription boxes. 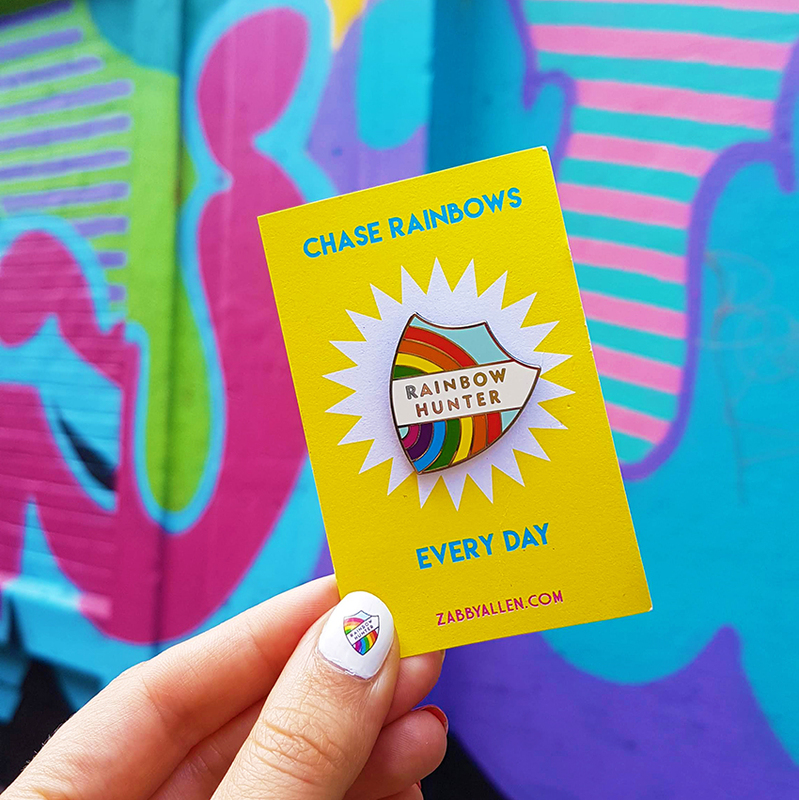 As well as editing, I create my own products (pins, patches, prints and things) inspired by all the things that make me happiest - like mac & cheese, rainbows and dogs. I also recently joined Toni Bee at the helm of In Colourful Company, a community of people who all share a passion for colour. We host 'Colour Walks' and socials across the UK and are working on some exciting plans for 2019 at the moment. Every day is different for me but mostly involves me sitting at my desk in my home studio. I love the variety that my freelance work brings me but I'm also looking forward to making some changes in my multi-hyphenate career to allow me to concentrate on creating more of my own work. I spend far too long staring at screens and I'd love to change that. This is once of the reasons I love In Colourful Company - it gets me out of the house and encourages me to meet new people (and my internet friends IRL!). I work in a spare room in our shared house in south east London. I love it as it's bright and airy with lots of storage and it's filled with all sorts of colourful things that I've collected over the years. Ideas definitely don't flow in here though, for that I need to give myself some time off. I love to travel and to get out into nature whenever I can. My Mum lives in a beautiful house in south west Scotland which is always a lovely place to visit when I'm not working (or for a creative retreat). If I'm at home I like to read my book, go to the cinema or to one of London's many street food markets, there's always something going on in an area of SE London. I find myself feeling overwhelmed or burned out on a regular basis. I consume so much information in the space of 24 hours that my brain is fried by the time I get into bed and I think a lot of other people struggle with this too. I'm trying to find a good balance between keeping up with the ever-changing social platforms to promote my business and time off-screen, away from my phone. There are definitely more pressing matters than this facing designers at the moment, but this is definitely something I've been thinking about a lot lately. I have plans to start my own small publication, sharing the stories that I know we all have hidden inside us! I've realised this year that my passion lies in print and I'd like to explore that on my own terms. Toni Bee (of In Colourful Company) and I also have plans for mini travel guides up our sleeves that I can't wait to get cracking on... That's an exclusive right there! We haven't told anyone about that project yet, so watch this space for updates. I want to create things that have real meaning behind them and that can make a difference to somebody's day. I'd love to see In Colourful Company continue to flourish, it's made such a difference to my own mental health and I know it helps other people too. Talk to other people who own indie businesses and build up a group of supportive people who 'get it'. I've found that having close relationships with other designer-makers and being able to ask them for feedback, advice or just having people to moan with is invaluable. I just did a course with Tiffany Han in which she encouraged us to establish what our values were and that's really helped me to realise what direction I'd like to take my work in. If your work is in alignment to your values then you're bound to be passionate about it - not just creating it, but promoting it too. Brave Girl in Crystal Palace stock some of my favourite designers such as Natalie Lea Owen and have a great section of feminist gifts. Alexandra Nurseries in Penge is a pretty cafe, garden centre and shop stocking lots of cards and treats from people like The Printed Peanut and ARK. Bunka in Beckenham (and Forest Hill) is where I go to get my Creightons chocolate fix or stock up on cards. Honeybournes in Ladywell is so beautiful that I nearly ended up renting a house I couldn't afford just to be close to it - they stock my lovely friend Katie of Oh Squirrel. Anything that encourages people to shop from independent businesses is SO valuable. The Just a Card campaign is really important and I think the Instagram challenge from earlier this year played a huge part in spreading the word and encouraging communication in the community. It does a great job of highlighting that just a small purchase can make a huge difference to indie businesses like mine. I think I first heard about the campaign on Twitter, which is weird because I rarely use it. I'm an Instagram girl through and through, but have recently started using Facebook more for the groups. In Colourful Company operates mostly through Facebook and I recently joined Leona's Indie Rollercoaster membership group which has been an incredible thing to be a part of - a community of other indie biz owners who are all willing to help each other.